Loft Artists Gallery: LAA Draws III, "An Examined Life"
Loft Artists Association is hosting an event in conjunction with the Aldrich Contemporary Art Museum's "Draw On" from March 11 to April 17, 2011. 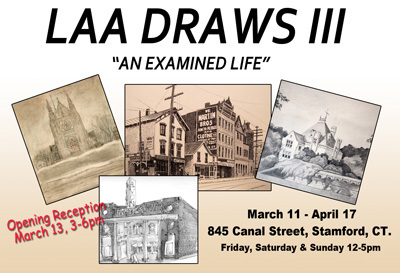 LAA Draws III, "An Examined Life," features original drawings of Stamford, CT scenes. There is an opening reception on March 13, 2011 from 3-6 pm. Free workshops are being offered Saturday, March 19, 2-5 pm and Saturday, April 9 from 2-5 pm. On March 19, guests will have the opportunity to sketch their favorite scenes of Stamford from provided photographs. On April 9, as part of "Draw On! ", the LAA hallways will be covered in paper, and public will be invited to create drawings on the wall. Other Draw On! events are taking place later in the month at The Aldrich and Silvermine Art School.